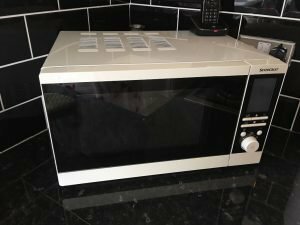 A white and black glass SilverCrest counter top microwave oven. 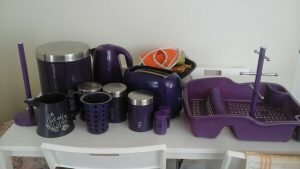 A collection of purple kitchen accessories, to include a kettle, a two slice toaster, a dish drainer, a kitchen roll holder etc. 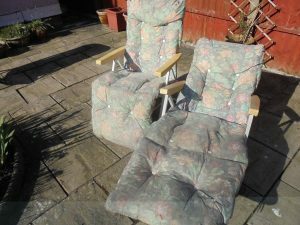 A pair of vintage solid wood framed reclining garden loungers, upholstered in floral patterned fabric. 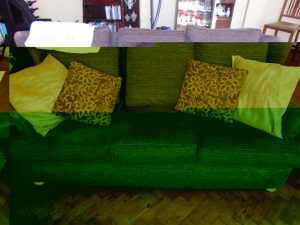 A three seater high back sofa on solid pine ball feet, upholstered in purple canvas fabric. 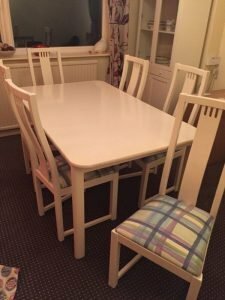 A white solid wood extendable dining table, together with six matching high back dining chairs. 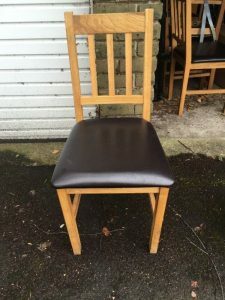 A set of six solid wood high back dining chairs, upholstered to the seats in black faux leather. 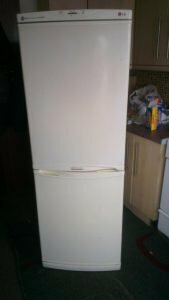 A tall standing white LG frost free fridge freezer. 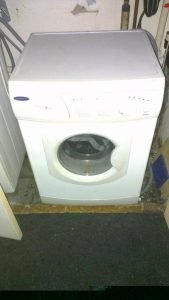 A white 8kg 1400 spin under counter washing machine. 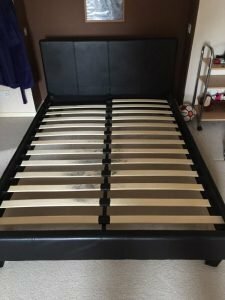 A large double bed frame and headboard, upholstered in black faux leather. 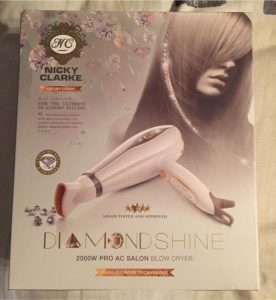 A brand new boxed Nicky Clarke white and orange diamond shine hair dryer. 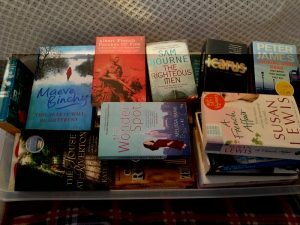 A large collection of paper back books, to include The Righteous Men, The House At Riverton, The wonder Spot. 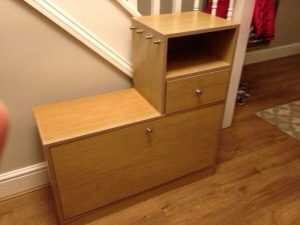 A large solid pine hallway shoe cabinet, having a shelf above a small drawer and a pull down shoe rack. 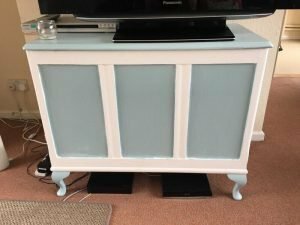 A hand painted white and pale blue solid wood sideboard, together with a black Panasonic 42 inch flat screen television. 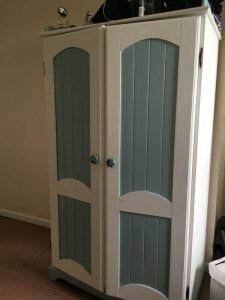 A tall standing hand painted white and pale blue double wardrobe. 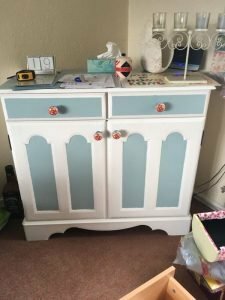 A small hand painted white and pale blue solid wood sideboard, having two drawers above a double cupboard. 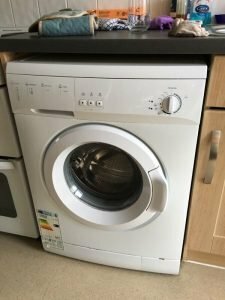 A white Tesco under counter 6kg 1200 spin washing machine. 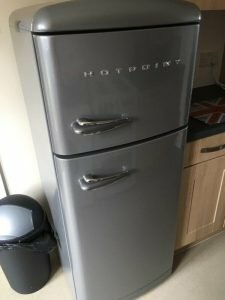 A tall standing retro style Hotpoint space grey fridge freezer. 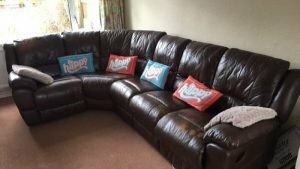 A five seater high back left hand corner sofa, upholstered in black faux leather. 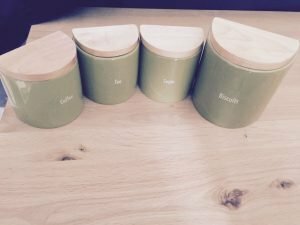 A set of green ceramic wood topped kitchen canisters, to include a biscuit jar and tea, coffee and sugar canisters.